Use of this add-on is limited to one minute in Locus Map Free. It is fully functional in Locus Map Pro version. Add-on enables visualization of selected points on the device screen with camera view. Useful during town sightseeing tours, for geocaching or for simple guidance to any point. select the points of interest to visualize. It is necessary to have the needed points downloaded in Locus Map. The add-on displays only points that are added on map via Points tab or LoMaps POI function, not POI database that is a part of LoMaps. 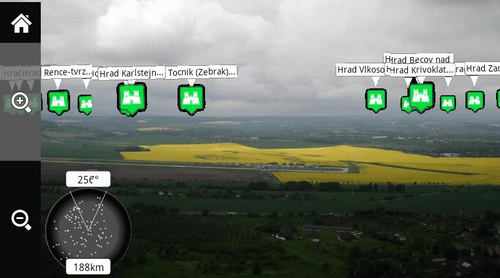 start the add-on and watch your points hover on the camera screen on their real-world positions.